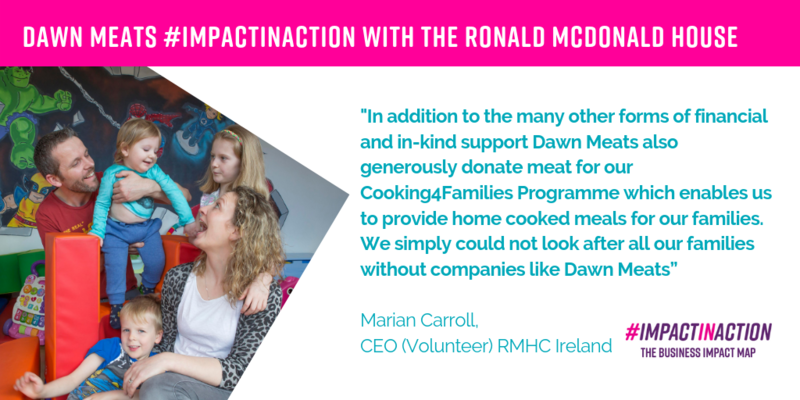 Dawn Meats partners with Ronald McDonald House Charities (RMHC) Ireland in seeking to raise awareness of the important work carried out by RMHC and by giving financial and in-kind support for their on-going activities. Through these contributions and those of other supporters, RMHC Ireland is able to keep their doors open to families, who are far from home at a time of crisis, seeking the best available care for their child. Hosting fundraising events which benefit RMHC Ireland and building awareness for the needs of RMHC House and the families served. The Ronald McDonald House is situated on the grounds of Our Lady’s Children’s Hospital, Crumlin, Dublin. The House provides accommodation for 20 families every night who have seriously ill children in hospital with families staying for a few days or several weeks depending on need. RMHC provides wonderful support to families so they can remain close to their sick child. Many families travel far from home to get treatment for their seriously ill or injured children. Often, it can be a long time away from home, from family and from friends. The Ronald McDonald House program provides a “home-away-from-home” for families so they can stay close by their hospitalised child at very little cost. The Ronald McDonald House helps families to face the weight of illness together. Families are stronger when they are together, which helps in the healing process. By staying at a Ronald McDonald House, parents also can better communicate with their child’s medical team and keep up with complicated treatment plans when needed. The Ronald McDonald House allows families to stay close to their child for as long as they are undergoing treatment in Our Lady’s Children’s Hospital. Since the RMHC house was opened in November 2004, accommodation, care and support has been provided for nearly 4,000 families in Ireland. Through the many fundraising events supported or led by team members, Dawn Meats are delighted to have been able to make a difference.